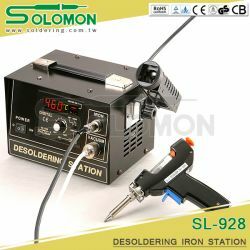 Desoldering station is solomon's top of the line service center and it will handle virtually all electronic repair and rework applications. 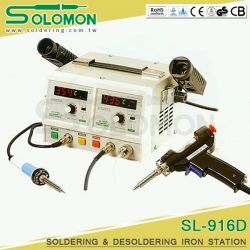 These desoldering stations are based on the principle of vacuum absorption of the solder from PC board. 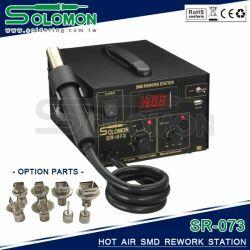 Easy desoldering the tin by reversing the vacuum to positive air flow, the suction nozzle and the thermal pipes are exclusively designed for suction of filters even with the soldering tin in fusion and no regular maintenance is required, for optimal performance. 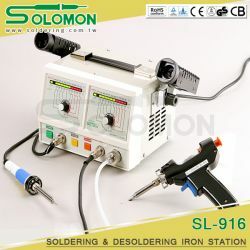 The SL-916 & SL-916D will simultaneously control temperature either of the two size of soldering iron and desoldering iron and desoldering handle,or control both soldering irons. There is a 2 position switch that shifts the control board from desolder to solder allowing the concurrent operation of 2 irons. The desoldering mode's temperature controlled from 410F to 900F or from 210C to 480C. The suction nozzle and the themal pipes are exclusively designed for suction of filters even with the soldering tin in fusion and no regular maintenance is required, for optimal performance. Combined powerful suction tin gun and high-performance welder for optimal repair works.